Stencil Designs and the Variety They Come In! Stencil designs come in as many different varieties as there are styles and that’s a lot. So, let’s try to study as many as we can - at least the most popular! Toile stencils are not so easy to find. This style is a repeated pattern depicting a fairly complex scene which does not lend itself well to stenciling. But there are a few very talented designers who have challenged themselves with this beautiful style of decorating. 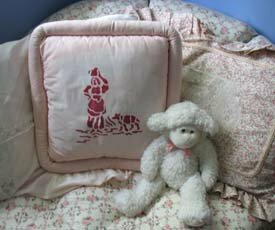 Here you’ll find the stencil art on the pillow free for you to try in your next project. Speaking of projects and ideas, don't miss the video below for some inspiration! Cool is an attitude, behavior, appearance or style. It's meaning is varied and changes with time and geographical location. Therefore, cool has no single meaning. That’s why we have several samples of Cool Stencils for you to display your brand of cool. Designs of the 1960's will forever be famous for the vibrant use of colors and ornate patterns. If that's what your into then don't miss this cool Paisley Stencil and find out a few things you might not have known. Art Nouveau is an international style of art and architecture that peaked in popularity at the turn of the 20th century (1890-1905). The name ‘Art Nouveau” is French for ‘new art’. 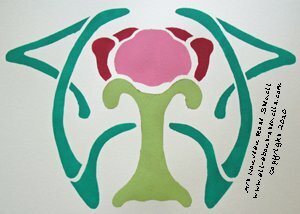 Here's the place for you to learn more about the Art Nouveau Stencil and get a free stencil design like this one! Art Nouveau was actually inspired by the Victorian Era which was famous for it's excessive ornamentation. I just added a Victorian Art Stencil for you to get familiar with this stencil design style. The painting above is called The Art Nouveau Rose. The colors used are Peony, Light Peony, Soft Apple and Turquoise. I hope you enjoy using this pattern in a project of your own. And if you find your self looking for more stencil designs like this Rose Stencil, we have several others for you including the Rose Art Deco Stencil. 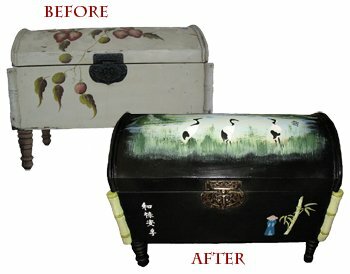 Oriental Stencils are one of the most popular stencil designs around. They offer clean lines, simple or ornate designs and create a peaceful mood (sometimes). You'll be surprised at what can be done with them. I'll show you how to redecorate furniture, create art prints for different tastes and even how to use stencils to jazz up your wardrobe. It's just one great idea after another for inviting classic designs into your house. Also, this idea page includes the ever so popular Chinese Lettering Stencils. Adding words with art is the best way to personalize so don't miss this article on Stenciling Letters before you start your next project. Plus you'll find the free stencils featured in each project all combined in one neat package.Don't miss it! 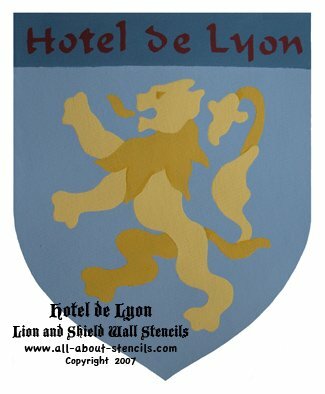 Let's go Medieval Europe next with this Lion and Shield Wall Stencils Decoration idea. Why not create your own Family Crest? Stencil designs are all about what genre they fall into and Southwestern Stencils are definitely a class of their own. Here you'll find four free stencils and some wonderful ideas for using them. To carry on this theme you can try Cowboy Stencils and Wild West Stencils where you'll find some old and some new stencil designs. Since we are talking about stencil designs that are related to regional and geographical areas, let's not forget about Celtic Stencils which like the art of the period often depict intricate knotwork and repeating patterns. If you are interesting in designing with this ornate art form then here you'll find one unique design and a Celtic Cross. Maybe you like the casual and easy lifestyle of living in the country. Using Country Stencils is a very common way to decorate for the timeless lived in comfy cozy home. For more simple homey designs, Folkart Stencils are the patterns created by peasants for utilitarian decoration. Try this free American Folk Art Stencil. Trompe L'oeil, (French for 'trick the eye'), is an art technique involving realistic imagery in order to create the optical illusion that the objects appear in three dimensions, instead of actually being a two-dimensional painting. 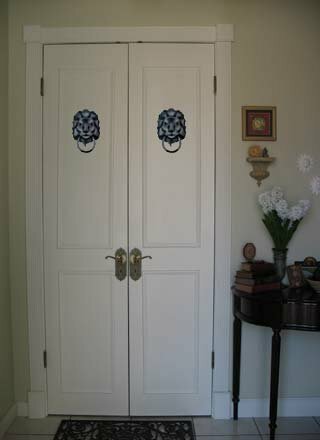 See how two plain doors on a coat closet are transformed with Trompe L'oeil Stencils and find out how you can add these fun little paintings throughout your home. Want to join the Street Art Movement? Then try some Graffiti Art Stencils and Graffiti Fonts, plus watch some fun videos of talented street artists at work! Have you ever considered recreating a work by one of the Masters? What! You don't feel comfortable enough to hand paint a replica? No problem! Use stencils. 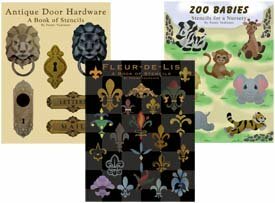 Find out more about Fine Art Stenciling and get ideas about how to create your own stencil of famous works. Well, there is more to come so keep checking back. We're not done yet! Here's that project idea video I promised you. Don't miss the free stencil at Eagle Stencil. Enjoy! Return to Home Page from Stencil Designs.